Dwolla: A New and Revolutionary Way to Pay and Be Paid! A New and Revolutionary Way to Pay and Be Paid! Say Good-By To Paypal and Credit Card Companies! Dwolla, a startup in the online payments markets, announced three new services Friday that it hopes will accelerate both merchant and consumer acceptance of Dwolla transactions, one of the big barriers that all payment startups — and frankly, anyone offering anything other than credit cards or cash — face; and that includes mobile wallets. Dwolla: A New and Revolutionary Way to Pay and Be Paid! The three new services include a Dwolla guest checkout service, where customers can pay without having a Dwolla account and Dwolla Price, where merchants, thanks to the money they’ll save on credit card fees, can choose to pass some of that saving back to customers as a way to entice them to use the Dwolla service — in other words, the merchant and the customer save. It also introduced new point-of-sale system integrations (Dwolla’s new partners include ShopKeep and Change) that let the merchant initiate a payment using a push notification to the customer’s phone. But maybe it makes sense to provide a little more context about Dwolla. As it happens, we just had Dwolla’s CEO Ben Milne on InformationWeek’s Valley View, a monthly, live Web TV show on Wednesday (the video from that segment is embedded further below). Little Dwolla, barely two years old, with all of about 40 employees in the technology hotbed of Iowa, has big intentions. It has created a modern payment network, and it aims to change how money moves and to upset what Dwolla CEO Ben Milne thinks is a costly, inefficient, fraud-riddled payments model. Dwolla has largely been viewed as a PayPal competitor, or a mobile wallet, the de facto ways to facilitate peer-to-peer payments, or consumer-to-merchant payments. But Milne says that these systems are merely building on top of the existing credit card network, and thus simply add to the cost of maintaining those networks. Companies like PayPal, Stripe and Square may aggregate, or process transactions on behalf of all of the traditional components of the payment ecosystem, but each step still extracts its fee on every dollar the network settles, says Jordan Lampe, who heads up communications for Dwolla. Instead, Dwolla is the network. The company’s APIs expose the Dwolla infrastructure for banks, merchants and others to move money, arguably more cheaply and efficiently. While the early focus in mobile and online commerce has been the typical customer-merchant transaction, Milne says the barrier to entry there is high. Not only must the customer want to use Dwolla, rather than a credit or debit card or cash, the merchant has to accept Dwolla as an option. Dwolla has built several easy ways for merchants to offer Dwolla payments through a kiosk, online, via e-commerce shopping cart extensions, through a merchant mobile app or even on some point-of-sale systems. But it is slow going. And to some extent, this is where the aforementioned three new services come into play. Even though the barriers to entry may be high, it doesn’t mean Dwolla is giving up the fight; it’s just arming itself for a long battle. 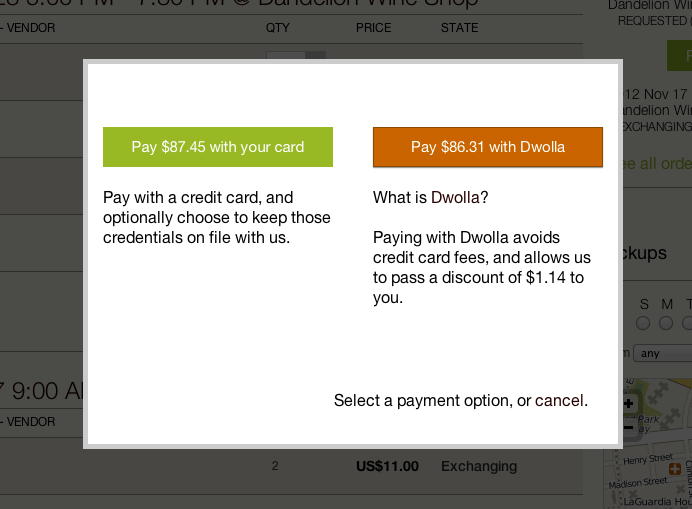 In particular, the new Guest Checkout, which lets a consumer pay online with Dwolla, even without having a Dwolla account, is part of Dwolla’s quest to create what the “ideal transaction.” As Lampe puts it, Dwolla realized “we were our own paint point.” Whether a consumer uses a credit card or a mobile or online payment application, there’s still this notion of belonging to a membership club. Dwolla wants consumers to have the choice of not being in the club. The new Dwolla Price feature is a way to reinforce the savings of using a new payments network that doesn’t have multiple hands out, grabbing fractions of hard-earned dollars. So far Dwolla has found more success in niche applications, like small businesses paying each other for ad-hoc needs or making wire transfers. It has also found success through partnerships, like with mFoundry, a mobile service provider with more than 800 bank clients who use (and provide customers) services like mobile deposit, loyalty programs and mobile bill pay … and now a secure online payment network with lower fees and instant clearance. There are merchants in all 50 states, Milne says, and those merchants are exposed to the Dwolla app (and thus, the consumer) using location. Dwolla transactions over $10 cost the merchant a 25-cent fee (PayPal’s published, non-discounted merchant rate is 2.9% plus a 30-cent transaction fee). Dwolla’s aspirations don’t stop there. The company has created FiSync, which provides real-time transfers for financial institutions. In other words, Dwolla aims to replace the automated clearing house (ACH), a 40-year-old network Dwolla claims is also riddled with fraud and inefficiency. Milne admits that Dwolla has a long way to go. FiSync launched with a single, Iowa-based credit union. But Milne also says the market (defined as the money moving through ACH) is $34 trillion annually. Milne sells an idea so simple, yet so mind-boggling: Use the Internet to move money quickly, safely and at as low a cost as possible. The result could transform banking and business, saving money and reducing fraud. Simply put, it means changing the world. And he thinks he can do it from Des Moines. If Dwolla thrives, its success promises to lead to more startups, more investments, more jobs and more wealth for Iowa. But first he has to overcome the skeptics, who question how Dwolla will ever make money, let alone move billions of it. Dwolla needs to sign up more users, merchants, websites and financial institutions. It makes 25 cents for every transaction over $10. That means it needs to handle millions and millions of transactions before it can make a profit. Milne also must find enough talent and funding to reach widespread usage. So Dwolla strives to be everywhere. An Iowa school district takes lunch money through Dwolla. Church members can tithe through the network. Without knowing it, you may be using an e-commerce site that uses Dwolla. And the state of Iowa is exploring using Dwolla to accept payments.